In 1835, Alexis de Tocqueville observed that Americans have “a lively faith in the perfectibility of man…They all consider society as a body in a state of improvement”. Such descriptions help explain our common stereotype as pragmatic idealists with a penchant for exaggerated emotions and an uncomfortable awkwardness in the face of negative, or even ambivalent, sentiments. Studies  have implied what many introverts could readily describe: America is a land where being quiet or reflective can induce strange looks or even pity. Being slow-to-judge—a trait so often honored by moral philosophers throughout history—is, to that subset of Americans which subscribes to a masculine, red-blooded vision of our tenets, seen instead as a sign of weakness and naiveté. This diluting of issues into binaries—weak or strong, moral or immoral, right or wrong—is a cultural tendency that has seemed to reach its apotheosis in the theatrical build-up to the new presidency and its traumatic fallout. In the age of Twitter, it is fitting that, regardless of political standing, who we are or what we believe can be summed up in “140 characters or less”. In a world of “infotainment”, where boundaries have become blurred between facts and opinions, we have become conditioned to overlook—or more commonly, to reshape or exaggerate—details that are unable to fit securely within the categories we have created. We have, accordingly, become a society of preconceived formulas, one that has come to mirror the pop culture worlds into which we escape. How, when living in a farcical fantasy, does one draw attention to absurdity? In such a state, it becomes not only possible, but inevitable, that we enter a “post-truth” world of “alternative facts”. 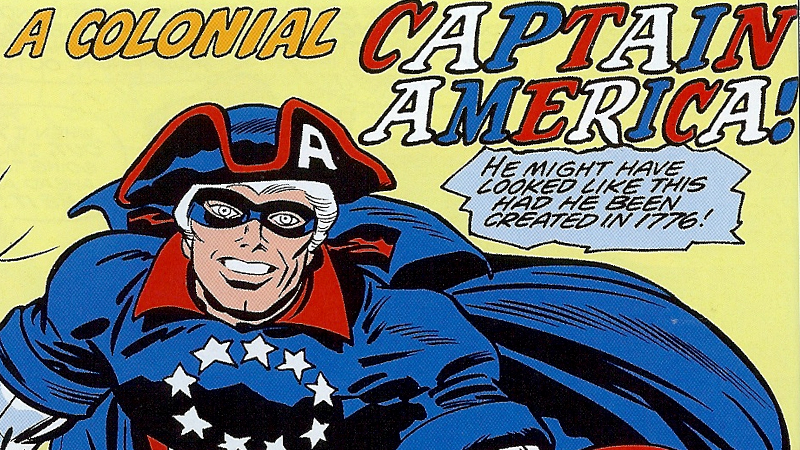 America seems to have become a caricature of itself, a Marvel universe come to life in which there are allies and adversaries and nothing in between. In our comic book world, intent on easy fixes, the reality star with the loudest voice was able to elevate himself into the role of hero. We have seen the transformation of Republicans from the party of Lincoln to the self-styled party of the “good guys”, fighting nobly to defend traditional values from the “bad guys” (mostly known, among many within the GOP, as “liberals”). For many, in looking “from pig to man, and from man to pig” it has become “impossible to say which [is] which” ; the self-proclaimed “saviors” of American values have become their biggest threat, and have done so whilst perpetuating exaggerations about the country’s origins that have turned into the stuff of myth. America’s founding fathers did not distrust science, or believe that the logic of “experts” was problematic and suspicious. Men like Thomas Jefferson were, as has been often repeated but little absorbed, men of the Enlightenment, mostly Deists; they wanted to keep beliefs based on anything besides rationalism out of politics. The idea that “the Government of the United States of America is not, in any sense, founded on the Christian religion” and “has in itself no character of enmity against the laws, religion, or tranquility, of Mussulmen [Muslims]” came not from the modern democratic establishment, but from the pen of John Adams, who included it in the unanimously ratified Treaty of Tripoli of 1797. Yet, less than 250 years after the Declaration of Independence, Americans have found themselves in a nation that, in many places, identifies as a Christian one—a nation which has seemingly always viewed religion and science as two equally personal sides of the same faith-based coin. We have come, it seems, to a time in which such revisions of history are not only possible, but unavoidable. While we look with a mixture of admiration and condescension towards our ancestors, who created their own histories, there is little that separates us, in terms of myth-making, from the paganism or tribalism of human prehistory. Because Americans have no ancient history, we have used the eighteenth and nineteenth centuries to act as its substitute. But in so doing, we have allowed the era to take on the appearance of the thing it has replaced. By mythologizing and revising the recent past, we have muddied and exaggerated the little history that we do have. In ironing out the more problematic elements in the narrative—the Trail of Tears, misogyny, Lincoln’s ambivalence about the abolition of slavery, wealth inequality, medical maltreatment in the field of mental health during the “golden” ’50s—we obscure the complexity of empirical reality and imagine ourselves into a world that is an oversimplified version of the one in which we actually exist. We often think of ourselves as living in an advanced, secular era. But we also live in a time in which New Age spirituality is to many appealing, in which CEOs are inspired by Kanye West , in which intuition trumps reason. We are both an enlightened age and a romantic—often ignorant—one; we must not forget, in revising our narrative to fit with our own personal views of the world, that senators and “barbarians” have always rubbed shoulders. By streamlining the world, we overlook the fact that several layers of data often exist at once. In order to understand Trump and the situation we have found ourselves in—both of which, up to this point, have continued to baffle many analysts and commentators—it may prove useful to acknowledge the dichotomy between the condensed concreteness of our ideas and the fogginess of the landscape where most of our reality unfolds. Dylan Taylor is currently working towards his MSc in Literature and Society at the University of Edinburgh, and received his BA in English from the University of California, Santa Barbara. His research interests include the relationship between literature and philosophy and the history of ideas. “What Makes Americans So Optimistic?”. The Atlantic. 25 Mar 2015, https://www.theatlantic.com/politics/archive/2015/03/the-american-ethic-and-the-spirit-of-optimism/388538/. Accessed 3 Feb 2017. Orwell, George, and Peter Hobley Davison. Animal Farm: A Fairy Story. London: Secker & Warburg, 1997. Print. Complete Works of George Orwell; V.8. Musk, Elon. “The 100 Most Influential People: Kanye West”. Time Magazine. 16 April 2015, http://time.com/collection-post/3822841/kanye-west-2015-time-100/. Accessed 3 Feb 2017.